I grew up eating these gooey chocolate treats from Rio de Janeiro where my brother and I were born. When friends came to visit the new baby, my parents would offer these traditional Brazilian truffles with a glass of champagne. Or so I was told. Given my modest claim to Brazilian heritage – my parents just happened to be stationed there – I love to find ways to relate to my samba-dancing, caipirinha-drinking origins wherever I can. 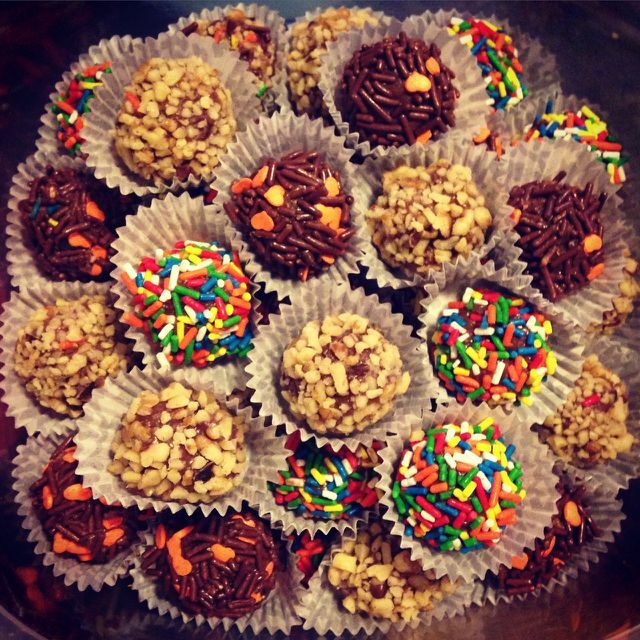 This recipe for brigadeiros is a favorite among my friends, although they like my samba too. In a pot, stir condensed milk, butter and cream over medium heat. Bring to a boil. Add chocolate chips and cocoa powder. Next, whisk the mixture until well combined. Reduce heat to low and whisk until mixture is thick and dense, about 15 minutes. Place mixture in a bowl and allow to cool for 30 minutes, then chill in the refrigerator for at least 4 hours. Once chilled, roll about a tablespoon of the chocolate into bite-sized balls and cover in chocolate sprinkles or crushed almonds or confetti sprinkles, or cookie stubble, or crushed potato chips or…use your imagination. Keep refrigerated. Serve in mini baking cups. 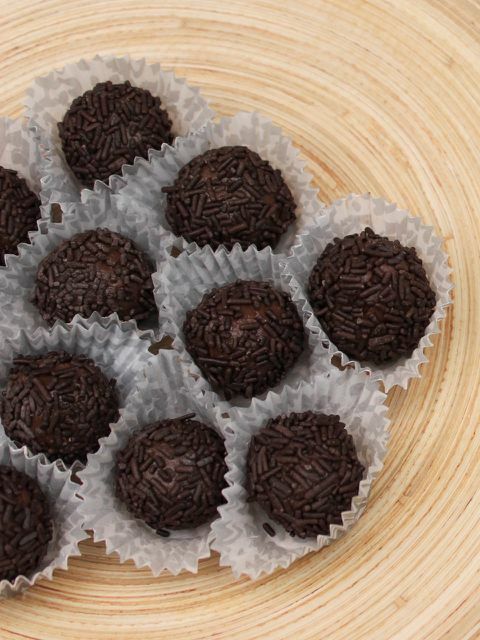 Makes about 25 tablespoon-sized brigadeiros.